One of the questions I get asked most often is, “Inger, what is the healthiest cooking oil?” As I sat down to write a article sharing the five oils I keep on hand and use regularly, and why none of them are Crisco or other popular vegetable oils, I realized I couldn’t explain all of the reasons why without going into some detail around the different types of fats and how omega 3 fits into the equation. So in this article, I am going to cover that information along with why I believe supplementing with omega 3 is essential for most everyone. Then next time, I’ll tell you how the information here plays into choosing the best cooking oils and I’ll share some oils that if made a regular part of your diet can actually improve your health and enhance your wellness. Research shows that 99% of us are omega 3 deficient, and a recent study at Harvard directly linked omega 3 deficiency to death in an estimated 72,000-96,000 people a year. To put that in context, there are approximately 40,000 deaths a year from breast cancer. Clearly, we need to start paying more attention to omega 3! Omega 3s help reduce internal inflammation, which is linked to almost every chronic condition that plagues us. They play a very important role in heart health: inhibiting thickening of the arteries, lowering the amount of lipids that circulate in our bloodstream, and helping arteries to relax. Omega 3s can reduce obesity by stimulating the hormone leptin, which regulates food intake, body weight and metabolism, and helps prevent cancer cell growth. Omega 3s can also reduce depression, improve mental clarity and focus, reduce dry or itchy skin, improve hair and nails, and help prevent autoimmune disorders and Type 2 diabetes. Omega 3 is an essential fatty acid. Fatty acids fall into three groupings: saturated, monounsaturated and polyunsaturated. Each type is made up of carbon atoms with hydrogen atoms that fill in the spaces around them. All fats have a combination of all three of these elements, but are identified by their most prominent fat type. In saturated fatty acids, all of the spaces around the carbon atoms are completely filled in, i.e., saturated. As a result, they are very stable regardless of temperature. Saturated fatty acids are found mainly in dairy, red meat and chicken, but they can also be found in tropical oils like red palm oil and coconut oil. Our bodies can also make some saturated fat from eating carbohydrates. Despite what you may have been told about saturated fat, our bodies require saturated fat to function properly, and saturated fat has been shown to improve cholesterol and blood sugar levels when eaten in moderation. Monounsaturated fats have a double bond between two carbon atoms and are missing two hydrogen atoms. They are called mono because of their single carbon double bond and unsaturated because not all of the spaces are filled—two hydrogen atoms are missing. Because the chain can bend at the double bond point, when you mix a large number of these chains together, it won’t be dense or compact; there will be room in between. As a result, these acids are usually liquid at room temperature and are relatively stable, though not as stable as saturated fats because they are not packed as tightly. The most common monounsaturated fat is oleic acid and examples are olive oil, avocados, peanuts, cashews, pecans and almonds. Your body can also make monounsaturated fat from saturated fat. Polyunsaturated fats are missing several hydrogen atoms and they have two—or more—double bonds. As a result, since there is more than one double bond, they are called poly, meaning many. At each double bond, there is a kink in the chain, so they tend to be very loosely packed and remain liquid, even in colder temperatures. They are highly unstable fats and they can go bad (turn rancid) easily when exposed to heat and light. When polyunsaturated fats turn rancid, free radicals are created and travel around in your blood causing damage to just about everything they interact with. Free radical damage has been tied to cardiovascular disease, autoimmune diseases, Alzheimer’s, Parkinsons’s, cataracts, tumors and aging. The most common polyunsaturated fatty acids are omega 3 and omega 6 fatty acids. They are called essential fatty acids because our bodies cannot make them; we must get them from the food we eat. Omega 3s can do a lot of good. But rancid omega 3s can do a world of damage. We need omega 3s, but we need to ensure that they do not turn rancid in our bodies. Antioxidants will mitigate this, so it’s important to take antioxidants regularly along with omega 3s. If you don’t want to buy both, there are fish oils out there that add the antioxidant Astaxanthin to the oil, which alleviates this concern. Or you can try krill oil. Krill oil is a very pure omega 3 source and also contains antioxidants to help mitigate any free radical damage that may occur if oils turn rancid in your body. Recent studies on Neptune Krill Oil have documented its benefits on a number of health conditions, so I do recommend Neptune Krill Oil. Let’s go back to omegas 3 and 6. Omega 6 sometimes gets a bad rap but the truth is that we need both of these essential fatty acids. The challenge in today’s food supply, however, is that omega 6 acids are used heavily in processed foods. Vegetable oils such as corn oil, sunflower, soybean, canola, cottonseed and safflower oil contain at least 50% omega 6 and very little omega 3. Beyond the vegetable oils in packaged and prepared foods, most people rely heavily on these vegetable oils for their in-home cooking, which is a concern (I do not even have a bottle of any of the above oils in my house). In addition, factory farming reduces the amount of omega 3s in meat, fish, eggs and vegetables. I’ve read that a chicken that is free to eat its normal diet of grass and bugs will lay an egg that is a perfect balance of omega 6 to omega 3. However, the traditional vegetarian grain-fed chicken will yield an egg that is more like 20:1 omega 6 to omega 3. Nature undisturbed knows to work in perfect balance, but our changes in farming have disrupted that balance and left us with an overabundance of omega 6. Ideally, we need a 1:1 ratio of omega 6 to 3, but our bodies can still cope fairly well with up to a 4:1 ratio. Unfortunately, the typical American diet is more like a 20:1 and can be up to a 50:1 ratio of omega 6 to omega 3. This is one reason it’s so important to supplement omega 3s. Not only do we need them in isolation, but we need them to balance our omega 6 intake. An imbalance of omega 6 and omega 3 will prevent all of the wonderful health benefits I mentioned at the beginning of this chapter. In addition, an unbalanced ratio that favors omega 6 over omega 3 can lead to weight gain, sterility, high blood pressure, digestive concerns, blood clots, inhibited immune function, inflammation and even cancer. How do we get omega 3s back in balance? I recommend you eat a varied whole food diet to get the three types of omega 3 essential fatty acids: ALA, EPA and DHA. ALA or Alpha-Linoleic Acid is found in dark green leafy vegetables, flax and hemp seeds, walnuts and vegetable oils. 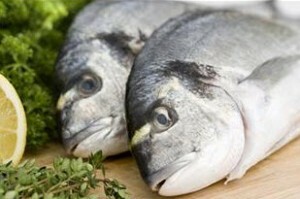 EPA or EicosoPentaenoic Acid is found in cold-water fish like salmon, tuna, cod and mackerel and in seaweed. It can also be found in grass-fed beef and free-range (non-vegetarian fed) eggs in smaller amounts. DHA or DocosaHexaenoic Acid is found in the same foods as EPA. Eating abundantly from these food groups will ensure that you have ample healthy fatty acids and a good balance of them in your body. If needed, the body can convert ALA to EPA or DHA, though the conversion process is slow. While we probably cannot overdo our dark leafy green vegetable consumption, supplementing ALA at high levels has been shown to have some adverse effects on the body. So when taking omega 3 supplements, EPA and DHA are generally recommended. Increasing omega 3 consumption overall is important, but so is ensuring that we have a healthy balance of omega 6 to omega 3 at every meal. I try to pay attention to my omega 3 food sources, as well as restrict my consumption of omega 6 laden foods and oils, but given modern farming practices and the overabundance of vegetable oils in foods, I still feel the need to take an omega 3 supplement with every meal to ensure I stay in balance. While I prefer pills because they tend to be more stable and they are more portable, my daughter hates pills but will drink a spoonful of fish oil. Today, fish oil often has a citrus flavor and is no longer a challenge to swallow, especially when mixed into a drink. Choose a brand that screens for impurities like PCBs and mercury and keep it in the refrigerator or away from heat and light. If it smells funny or changes color, throw it out. Because of its proven absorption and extensively studied research benefits, as I mentioned earlier, Neptune Krill Oil may be a great supplement option. Many people I know have switched from taking fish oils to only krill oil, while others take both, but choose a fish oil with antioxidants or take an antioxidant supplement such as astaxanthin along with it. Because we take omega 3s with every meal, we choose to use both omega 3 supplements and krill oil as well to balance the benefits and the cost. Whatever option you choose, adding fish or krill oil into your supplement routine has proven benefits. Making sure your diet is rich in antioxidants is also a good way to prevent potential damage from any oil that may go bad. One caveat: Omega 3s can exaggerate the effect of prescription medications that are trying to do the same thing. For example, if you are on blood thinning medications like Coumadin, Plavix or even aspirin, you should discuss omega 3 consumption with your physician because it can be a blood-thinning agent. And while omega 3 can be a helpful part of insulin and diabetes management, it can raise fasting blood sugar levels, so if you are on blood sugar medications such as Glucotrol and Glucotrol XL, Micronase or Diabeta, Glucophage or insulin, talk to your doctor as your dosage may need to be adjusted.